Many kids will be out of school for spring break next week. Need some active spring break activities to keep your kids busy and not in front of a screen all week? No fear, there are several different free and low cost activities to help you and your kids get active this spring break! Johnson County is home to over 100 parks. You are sure to find a few that you and your kids have never visited. Little Mill Creek Park in Lenexa, KS is a popular one. Enjoy the playground or bring a soccer ball and have fun on the fields! 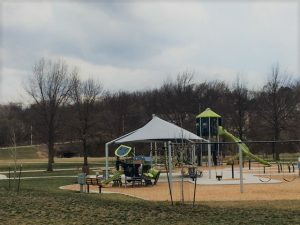 Another popular choice in the area is Black Bob Park in Olathe, KS or Franklin Park in Prairie Village, KS. Playing and chasing after your kids for just 30 minutes can burn about 215 calories for a 175 pound person. Have fun! There are over 350 miles of hiking, walking and biking trails in Johnson County. You could choose a new spot to hop on a trail every day during spring break and never visit them all! Maybe a hike on a nature trail sounds fun? Ernie Miller Nature Center is hosting a Spring Fling event all week. Visitors can hike the trails and view the aquarium all week long. Also, park naturalists will host a special program featuring live animals each day. Read a story while taking a walk at Antioch Park. “When Spring Comes” written by Kevin Henkes, and illustrated by Laura Dronzek, is the latest Storywalk book to be featured in this cooperative effort between the Johnson County Library and Johnson County Parks and Recreation. And did you know, just 30 minutes of walking each day decreases your risk of stroke, reduces your cholesterol and lowers your blood pressure? So keep you and your kids from being glued to a screen next week and do something good for your health! In case the weather isn’t great, how about a lap or ten around a roller skating rink? Skate City in Overland Park and Shawnee will be open during spring break to help you and your kids get active. A 160-pound person will burn about 548 calories during 60 minutes of roller skating, while a 200-pound person will burn about 683 calories in that same amount of time. Talk about a workout! Prefer the ice instead? KC Ice Center in Shawnee will be hosting several spring break public skates throughout the week. Ice skating is a great aerobic workout, which is an important part of heart health. So layer up, enjoy the ice and protect your heart! There are several different activities to keep you and your kids active while doing great things for your health! Enjoy the week and get moving!